Welcome to The Standard Directory of Third Party Administrators, a service of Judy Diamond Associates, Inc. This Help section will show you how to get the most out of our newest marketing tool. Before gaining access to the TPA Directory, you must sign up for it. The easiest way to gain access to is to call our knowledgeable sales staff at 800-231-0669. Once your account is active, you’re ready to start searching! Go to www.TPADirectory.com and enter the username and password you received into the login box on the upper right. Click "Login" to login. You can jump right in and begin searching here. For more information on searching in the Directory, please see the Search section. The Basic Search Options section has different options that you can populate either by selecting an item from a provided list (such as Category or State) or a blank field you can type a value into (like City or Zip Code). It is possible to populate boxes from more than one of the six different sections. Doing this will provide you with a more targeted set of results. 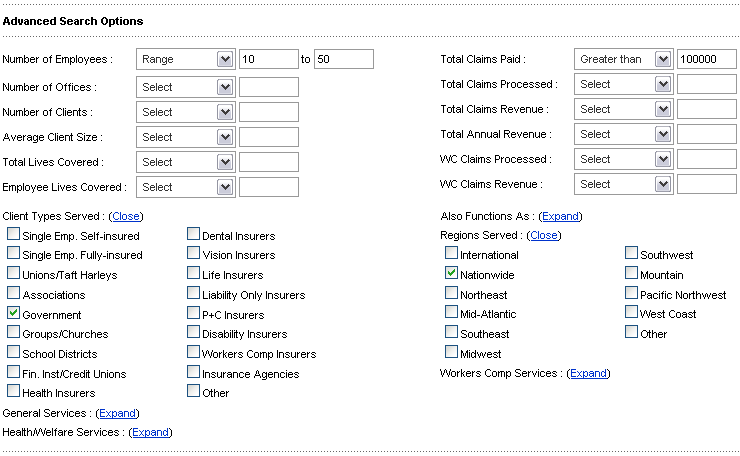 For example, you can search for companies in the Health/Welfare category starting with "C". Alternatively, you can just search for companies in the Health/Welfare category and then sort the results by Company to view them in alphabetical order. 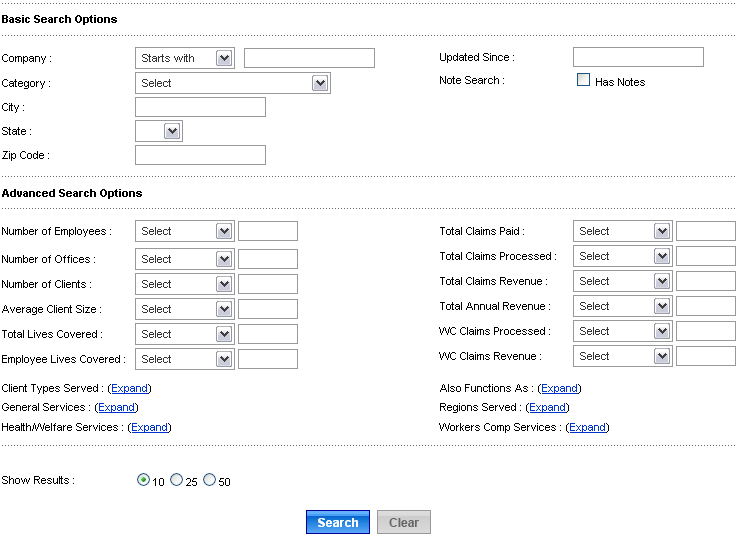 The Advanced Search Options section consists of fields that you can populate either by checking an item from one of the expanded lists (such as Client Types Served or Regions Served) or by selecting a comparison type and entering a value (like Number of Employees or Total Claims Paid). When searching by the name of a Company our database will try to match your search query exactly. You may know a company as "Disability Services" but if they are listed as "Disability Reinsurance Management Services Inc" your search for "Disability Services" will not find any results. A search for "Disability" will, because you’ve given the database more leeway to find results by being a bit less specific in your search. You do not need to enter commas or dollar signs in your number (so 570000 instead of $570,000). The column headers in this database can be clicked on to re-sort your data. Click the column header once to sort your data in descending order (i.e. the highest numbers will appear first). Click the column header again to sort your data in ascending order (i.e. the smallest numbers will display first). The database will default to sorting by the Company column in descending order. It requires only a few clicks to export information from TPA into Microsoft Excel or any other database program. Begin as always by running a search. Once you have your results, click the "Export" button located on the bottom left hand side of the screen. A pop-up will then prompt you to open or save the CSV file.